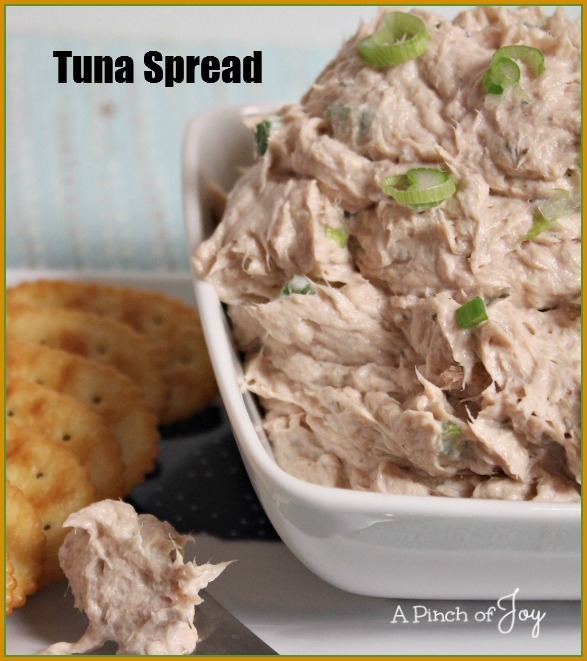 Tuna Spread is a healthy – and tasty – choice for game day snack or appetizer! Tuna is a great source of protein, vitamins and minerals. It contains heart healthy omega-3 which helps prevent high blood pressure, maintain heart rhythm and improves the body’s insulin response. If you want to add healthy fish to your diet, canned or packet tuna is an easy, inexpensive way to do that. Tuna is low calorie and low carb, and a very healthy addition to your regular diet. A healthy snack or appetizer for the Big Game — win win! The tuna flavor shines in this cream cheese based spread. All the other ingredients are there to enhance the tuna. I use thumb sized green onions. If the green onions I have on hand are smaller I add one or two more. You could substitute greek yogurt or mayonnaise for the sour cream. We like a thick spread, but if you want less thick add another tablespoon of sour cream or substitute. I mix the spread by hand to preserve the tuna texture somewhat, but you could also use a mixer. Serve with mild flavored crackers or crispy toast slices. Use the chopped fresh parsley as a garnish on top of a few crackers with tuna spread and / or the bowl full of the spread. I also use the thinly sliced tops of the green onion for garnish, sometimes with the parsley and sometimes without, as I did here. The thin green rounds of the onion tops make an especially nice garnish if you are serving crackers you’ve spread ahead of time. Why is this called a spread and not a dip?? Most people hear dip and immediately think chips. First of all, you don’t want the saltiness of chips added to this flavor. Second, it is thick and many chips won’t stand up to being dunked in the mixture. Of course, feel free to try your favorite hefty chip or use crackers as your dipper. No judgement here! A healthy, low carb appetizer that is sure to score points while cheering the Big Game! Chill for at least two hours to allow flavors to meld. Serve with mild crackers or crispy thin toast,preferably low or no sodium. I really like the looks of your Tuna Spread, I especially love that dill, can’t wait to try this one. Thank you so much for sharing with Full Plate Thursday and have a great week! This looks delicious! Might make this today for a movie snack/lunch on this snow day. Following from “Wow me Wednesday” on Ginger Snap Crafts.